Home › Home and Kitchen › Se Grill - Portable Folding Barbeque Closed Size 9.5X9.5X3.8In. Se Grill - Portable Folding Barbeque Closed Size 9.5X9.5X3.8In. 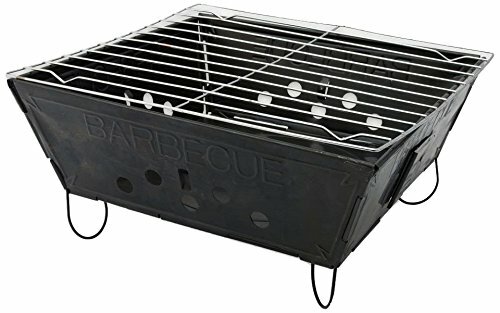 SE Grill - Portable Folding Barbeque, Closed Size 9.5x9.5x3.8in. Steel Material. 1 Pc Folding Barbecue Frame: Open Size : 9-1/2" X 9-1/2" X4-1/2", Folded Size: 9-1/2" X 9-1/2" X 3/8". 4 Pc 4-3/4" Removable Legs. 1 Pc9-3/4" X 10" X 19/64" Grill Top. Total Weight of Grill : 0.75 Lbs. MaximumWeight on Grill : 6.5 Lbs. Compact & Light weight. Quick Assembly. FoldsCompletely Fast. Great for Hiking, Camping, Backpacking Etc.